The final quests consists of following a massive MechWarrior-esque robot who basically does all the killing and fighting for you. All you have to do is stay behind him and collect the loot of the dead Enclave soldiers – loot you’re not going to need anyway, but hey, in an RPG, grabbing loot is a reflex. You then shoot a few Enclave baddies in a building, flick a switch, and the game ends. It was so easy I kept on telling myself this was just an intro to a massive battle. When I realised I had actually finished the game, I was all ready to grab some chips, and make me a nice pot of tea, but before I even got up off the couch, the ending sequence was already over. Five pictures slid by, with the voice over telling a three-sentence story, and that was it. The end. That’s your reward for 140 hours of gaming and 64 Euros. A sepia slideshow. For more trackmania videos, visit TM-tube. But there is still room for improvement: I for one, would like to be able to subscribe to a customized RSS feed which would alert me of new radars. Anyway, here is a list of camera’s newly installed on the roads I travel the most. I didn’t mention the ones on the southern part of the R0 (around waterloo, the big turn) as this is clearly indicated with road signs. There is also one around Tervuren 4 armen crossroads but I don’t remember the exact location..
As you can see, there are also a few planned around Kortrijk! So here is my upgrade story for my laptop: it’s a Dell D830 with Nvidia Quadro NVS 140 and Intel(R) PRO/Wireless 3945ABG. The upgrade procedure itself went smooth although I never really know if I have to enable more repositories or not when asked. The upgrade will by default only take the default suse repo’s into account. So I left it that way, but it could explain a few issues I ran into later.. Anyway, after the upgrade reboot, I don’t get a graphical login screen.. I run sax2, and this fixes the issue, but nvidia driver is not used. So I add the nvidia repo from the community repository list. I see there is now a new driver “G02” instead of the “G01” I used to use. So I mark this package for installation, but some dependencies fail.. I don’t know the exact list anymore, but one of them was related to the kernel, which surprised me as I just upgraded (but I did have the jengelh realtime kernel installed before I upgraded). Something was odd with the package management.. and I also got an error that updates could not be found because no backend was configured. what the..? So next thing to do, was configure the online update. When I tried that, it wouldn’t work because “SSL negotation failed”. This definitely smelled like a bug, so I filed one and it has already been confirmed by a suse employee by now. So I added the update repo manually (although I had read about the new smolt integration and would’ve loved to register my system) and configured the new updater applet (kupdateapplet, which supports packagekit) to use the zypper backend which I first had to install manually (kde4-kupdateapplet-zypp). Finally some updates were found, but the new tool failed to install the patches (have to file a bug next time patches are issued) and asked me if I wanted to use yast instead. Funny how they anticipated problems there. 🙂 Using yast, there was no problem of course. The smolt update even triggered a proper nvidia install without dependency problems. Having updated, after I relogged on, the nvidia driver was effective and remembered its configuration from before the upgrade. Since the version was now called G02, I had high hopes that this would incorporate all the fixes NVidia addressed in their beta drivers to get rid of the KDE4 desktop effects performance problems, but alas, it seems this is still beta. I might want to install the beta driver after all, I’m tired of the bad performance. 😉 My ATI radeon 9800 PRO in my desktop performs better! Although I have to admit, even the stable nvidia drivers seem to have received a few improvements the last few months. If you are unfamiliar with user css: right-click on the page and edit the site preferences. In the display tab, point the “my style sheet” to the relevant user css file. Make sure “my style sheet” usage is enabled in Preferences->content->style options->presentation modes->author mode->my style sheet (also more easy accessible through manage modes under the style mode button on the extended view bar if you use that). For its time, it really is a truly amazing demo! Read the history behind it and its 40th anniversary this year. Sometimes, people like me like to run stuff on a dedicated cpu instead of using all available cpu’s. The key to success here is this nifty tool: schedtool. Unfortunately, I didn’t find it anywhere in suse’s package database, nor the build service (if you know a repo or util package, please let me know). But don’t worry, I guess nobody cares to make a separate package as it is such a small util. Just download the source from the website and make/make install (configure isn’t even needed). -a is followed by a bitmask in which each bit represents a CPU. I have found that somehow it is best to always use the hexadecimal notation, even if your number is less than 10. Can you believe it??!! After all these years of denial? I for one surely didn’t see that one coming. 🙂 Read the full changelog here. Anyway, kiki the nanobot is not to be confused with my friend. It is an open source 3d puzzle game, or like the author states: “basically a mixture of the games Sokoban and Kula-World“. A colleague recommended me to try it out. I was a bit reluctant as it didn’t seem to support linux, only windows and mac were mentioned on the website. Which was quite awkward as it seemed to use python and sdl. So today I decided to find out the truth about kiki and checked out the cvs head. 🙂 I was delighted to find a linux subdir with a readme, yes, there were even makefiles! 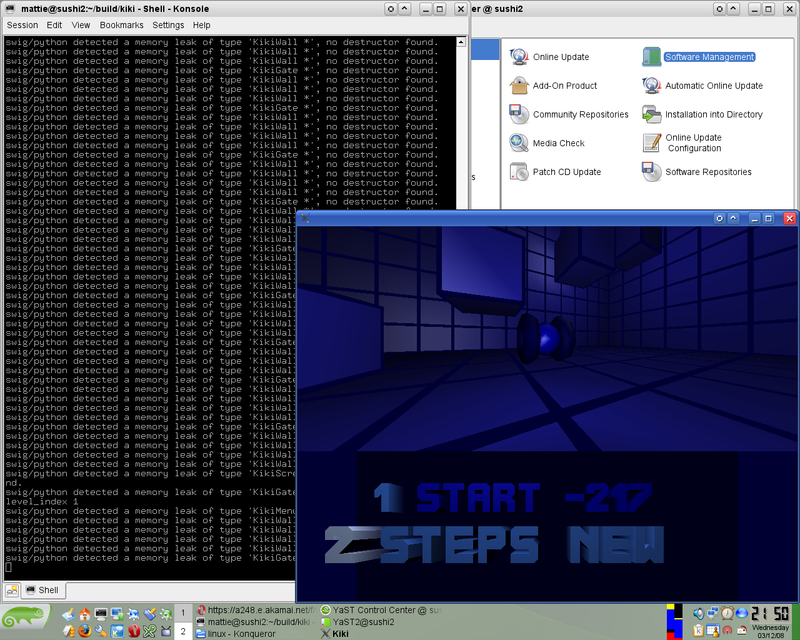 I installed the prerequisites (dev packages for python, sdl, sdl_image, sdl_mixer) and was ready to go! I did have to adjust a makefile to point to the right python headers (why not use the general /usr/lib/python instead of /usr/lib/pythonX.X?) Then, everything built just fine. Kiki’s core is in C++, levels and configurable parts are written in Python, bridged using SWIG. Kiki the nanobot seems like a great puzzle game although it could use some polishing here and there, but given its age (6 years!) and the timeframe in which it was developed (3 months, for a contest), I think it’s quite an achievement. 🙂 You can read a dev post-mortem here.